What should you know about tyre pressures. Costs £1 per tyre with free top ups for the life of the tyre! 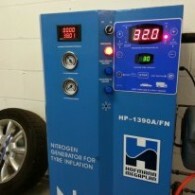 With nitrogen, it can take up to six months to lose 1.5psi.